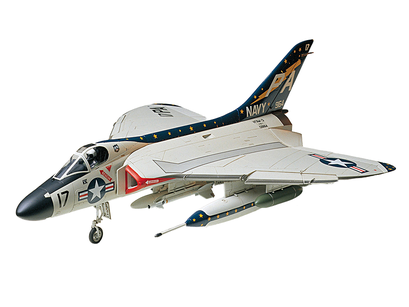 This model kit depicts the Douglas Skyray, which entered U.S. Navy service in the 1950s as a carrier-based interceptor. The unique delta-winged shape of the aircraft has been accurately reproduced and the wingtips may also be assembled in folded position. The leading edge slats may also be posed in open or closed position while the pitch trims are movable. Parts for ordnance such as Sidewinder missiles and rocket pods and one pilot figure, as well as three marking options are included.